Sind Eure Socken für Euch gut genug? Ich finde ja grundsätzlich alles an meinem lieben Mann super und in vielen Dingen ist er einfach definitiv besser ausgestattet als ich. Klar habe ich mehr Blusen als er Hemden und sicher auch eine höhere Anzahl an Jeans. Aber in einer ganz bestimmten Sache übertrumpft er mich absolut – nämlich in seinem Sockenbestand. Es ist jetzt nicht so, dass ich gar keinen Socken habe, das schon, aber in der Mehrzahl sind die irgendwie interessant, zum Beispiel habe ich hellblaue Wollsocken oder bunte ABS-Socken mit Noppen an der Fußsohle. Woran ich einen grundsätzlichen Mangel habe, das sind schwarze Socken – ganz im Gegensatz zu meinem lieben Mann. Denn der hat ein ganzes Fach voll wunderbarer schwarzer Socken, und irgendwann habe ich mir die Angewohnheit zugelegt, grundsätzlich bei einem Bedarf meinerseits an schwarzen Socken mich aus eben diesem Behältnis zu bedienen. Dass ich Schuhgröße 36 trage und mein lieber Mann Größe 42, habe ich dabei irgendwie verdrängt. Seid Ihr kleidungsmässig in allen Bereichen gut ausgestattet? Oder gibt es bestimmte Sachen, die Ihr Euch anderweitig beschafft? Wird das eher mit Verständnis aufgenommen oder stößt Ihr mit Eurem Verhalten auf Unliebe? Are your socks good enough for you? Generally I´m really found about my lovely husband and there are some things in which he is much better provided than myself. Of course I own more blouses and surely more jeans. But in one special thing my lovely husband overtrumps me – namely how many socks he has in stock. For my lovely husband becomes due to my confirmed habit in using his socks the effort that he has to add my wastage to his own and I want to thank him for this at this point when he remembers me in time that a washday is necessary. Do you have enough clothes in each range? Or are there some things which you have to organize elsewhere? Do you get understanding for your behavoiur? And thank you so much that you´re enjoying reading my blog, I try always to do my very best! Nice photos and really cool outfit, you look great, I like your skirt, what a great shape and that blouse is so nice, the perfect touch to the outfit also you are really beautiful and your shoes rock! Your have a lovely blog by the way and I am a new follower on GFC and Bloglovin! Hope you will like my blog and follow back! You´re always welcome, dear Alexandra :) Thank you! :) I "borrow" my husband's socks, too... :) And yes we have a very similar difference in shoe sizes, but mens socks have this funny ability to shrink, don't they? 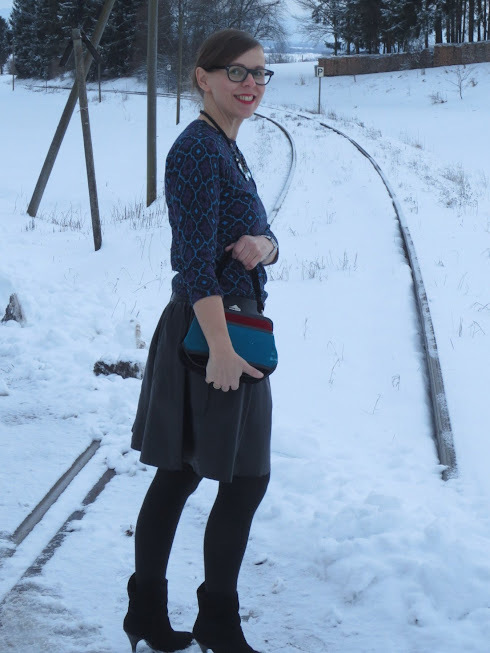 Die Tasche zu Deinem schönen Outfit gefällt mir gut, darf ich fragen, woher Du das schöne Stück hast (evtl. Marke)? Da mein Schatzi unter der Woche nicht bei mir wohnt (Fernbeziehung), bin ich auf meinen eigenen Sockenbestand angewiesen, der ist aber sehr sehr gross (Tennissocken in allen Farben). Was mir ein wenig fehlt, das sind Jeans, da ich sie nur in der Freizeit trage, ich möchte aber dieses Jahr drei paar davon kaufen, Marke ist mir egal. Ja, Jeans sind immer gut, ich glaube auch täglich, dass ich zu wenige davon habe ... Viel Glück und Erfolg beim Kauf Deiner drei! Deine Tasche ist soo schoen,danke fuer dein Kommentar! whata cute look, i love this! How nice, thanks a lot! sehr schöner Look! das Täschchen ist wunderschön! Schwarze Socken kann ich dir gern ausborgen, die habe ich en masse. Aber auch mit Hello-Kitty-Socken kann ich dienen. Ist mal ne Abwechslung. Your sweater is amazing! Love it so much! Socken habe ich leider auch zu wenige, aber ich benötige eher selten welche. Haha, ich kann dir aus Erfahrung sagen: Zu viele schwarze Socken sind auch keine Lösung. Die kriegt man nämlich immer in der Wäsche durcheinander, die Paare zusammenzuhalten ist unmöglich! Tolle Schuhe und süsse Tasche! Ich weiß, wovon Du sprichst, liebe T. ... da ich zum Teil hundert Paar schwarze Socken nach dem Waschen zusammenbringen muss! Dein Blog ist zwar noch ziemlich frisch, aber schon sehr schön. Ich glaube, du hast richtiges Potential und kannst wirklich Etwas aus deinem Blog machen. Ich bin gespannt, wie er sich entwickelt. Schwarze Socken sind auch Mangelware in meiner Schublade. Auf die Idee bei meinem Freund zu kramen, kam ich auch noch nicht. Gute Idee... die Größenunterschiede sind zum Glück mit 2 Nummern ertragbar. I love this outfit, the patterns and the colours...what a cute little bag! Love this casual but chic outfit... and I'm totally in love with your ankle boots! Thanks for the comment and follow. Followed you back! ty so much for following, i got you back of course! Loved your heels , loved your blog as well. If you want we can follow each other via GFC if yes follow me & I will surely follow back! Wow such a lovely and chic look ! I always adore Your combos :) this bag is just amazing <3 ! these looks amazing and the shoes are to die for! You look so beautiful! I LOVE how you styled that skirt =) Can't wait to see more! Vielen Dank, dass Du nach der Marke der Tasche geschaut hast, ich bin erstaunt, wie das gute Stück immer noch modern ist. Ich habe auch noch Dinge meiner Mom, sie ist 63 Jahre alt, aber die Stiefel und Röcke sind ja wieder in. hello dear, thanks for the comment! My blog is written in Portuguese, but in the right sidebar has the option to translate to all languages ​​simply select. My hubby is into socks too. I think socks are one of those accessories guys are into haha. I used to have just ton of shoes, but I cleaned it out pretty well a couple of years ago when I moved. Now I don't have much of excess clothes anymore. lovely photos! I have the same problem with black shocks but I use my brother's! You look lovely. My husband is the opposite, he doesn't have to wear dress clothes to work so he has an abundance of white athletic socks! I never have enough socks! Most of the time when I wear them they don't even match! It's awful....same with underwear, I'm always having to do a load just because I ran out. Love that purse! Beautiful contrast with a dark palette outfit :) I love your blog! Specially the photos because they are so detailed and clear, I can really understand about your post. I followed you on GFC and on BlogLovin'! Maybe you can come by mine too and maybe follow each other? :) Thank you for this post! I can't wait to read more of your posts. More power to you! I always find, that i don't have enough camis to wear under my shirts. Even now, i need to go shopping to get more. I always feel like I need more jeans, too. I love that your wear skirts & dresses. I don't wear them enough and you always inspire me to wear them more. You look really beautiful! I like you style at all. We are new followers of your blog and we invite you to our blog: follow us, read and leave comments! Lol I do hope you are wearing your own tights, because otherwise 1)they would be too long! (I'm sure your hubby is also taller than you?))) and 2) we would know he wears tights! (Have you seen "Men in Tights" - a parody movie of "Robin Hood"?) Love this skirt on you, you also have a lovely bag! PS I started to read your posts in German.. thanks again for writing in 2 languages! Thanks for reading in German, I think it´s much better than my Englisch and thank you, too, that you´re like my skirt and bag. Hope to hear soon from you, dear Tali! I hope you aren't cold, standing out in the snow! I really like your clutch. At least your husband allows you to take over the closet---I know that if I shared a closet with my boyfriend, it would be 70% of my clothes! Dear Brittney, to be honest it was really cold ;) And it´s no problem to share the closet with my husband because we have a dressing room. Ich bin ganz gut ausgestattet.Bislang brauchte ich mich noch nicht am Kleiderschrank von meinem Mann bedienen ;-). Ein tolles Outfit trägst Du. Der Rock steht Dir sehr gut. Außerdem gefällt mir an Deinen Bildern, dass Du so viel Lebensfreude ausstrahlst. Und dass Du kleidungsmässig mehr als bestens ausgestattet bist, darüber brauche ich keine Sekunde lang nachzudenken!